OL4 English Lakes – North Western Area. Introduction: Sometimes walks do not pan out as you expect. In this case, the walk was supposed to be the Coledale Round, a pretty hard 11 mile or so (depending on which peaks are included) horseshoe walk from the village of Braithwaite near Keswick. 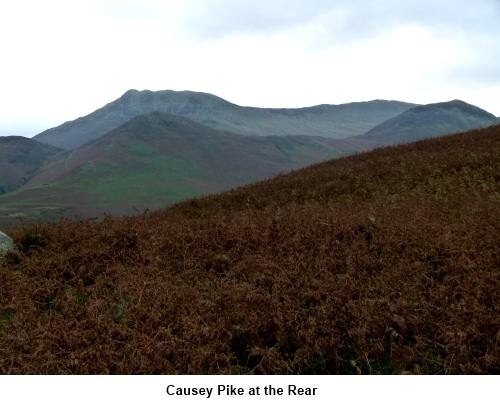 Grisedale Pike is the first peak in the round and is tough in that you go from virtually nothing to 2595ft in under 2 miles. My companion and I completed this and, although we expected strong winds, nothing prepared us for the true gale force we met as we crested the summit. We battled on briefly but with only our walking poles (out sideways at 45 degrees!) 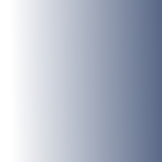 preventing us from disaster. Then, just ahead of us, a lone walker was literally blown away and landed in a stunned immobile heap about 10 feet from where he started. After making sure he was ok, we (and he) decided attempting to complete the round was foolhardy and we opted for the escape route at the head of the valley back down the low level old miners’ track. 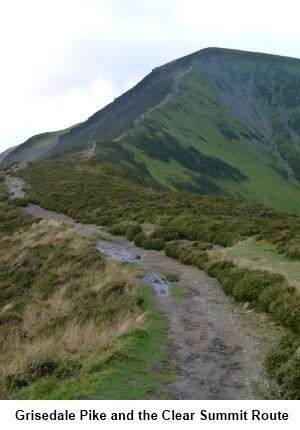 However, Grisedale Pike is a perfectly respectable walk in its own right for anyone without the time or inclination to do the full round. It is easy to find the route and offers very good views. The walk starts from Braithwaite village, or more correctly from a parking area just outside the village on the B5292 Winlatter Pass road. For Braithwaite itself, turn west off the A66 between Cockermouth and Keswick, close to Keswick. Refreshments are available after your walk at the Royal Oak or Coledale Inns in Braithwaite. As you leave the village on the B5292, the parking area is on the left after a sharp right hand bend and immediately before a blue parking sign which tells you of parking in ½ mile. Start: As you enter the car park, note the steps on the right which are where you start and the track with a barrier to the left which is where you will return. 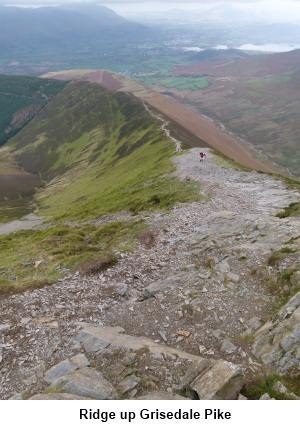 Climb the steps following the fingerpost for Grisedale Pike. At the top of a rise, the path becomes a grassy path and forks. Take the right fork. The path up the Sleet How Ridge to the summit is obvious and you only need to follow this. From the summit (NY 199226), there is a gentle descent and above Hobcarton Crag, bear left to Coledale Hause (NY 188212). From here there are good views west to the tip of Crummock Water and on the right of the valley, the impressive Gasgale Crags. 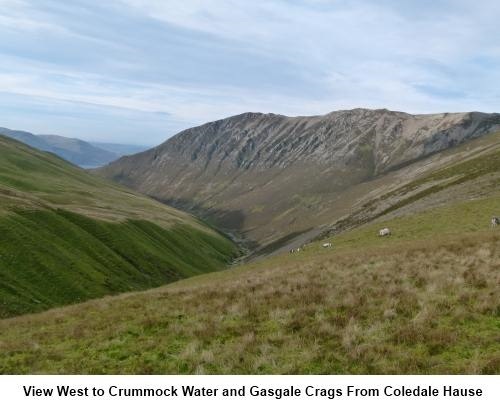 The return route is clear, as you face north east from the centre of Coledale Hause, there is a clear track which heads back down the valley. 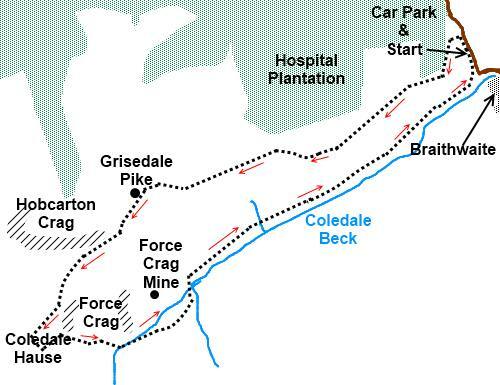 There are actually two paths but the clearest one (starting at NY 190212) drops you on to the broad gravel track just north east of the ugly remains of the Force Crag Mine buildings. 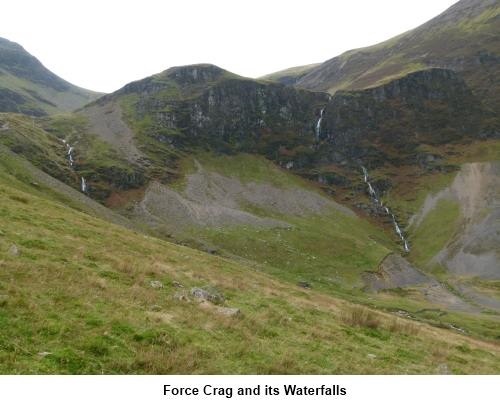 As you descend to this point, the waterfalls flowing over Force Crag itself can be quite impressive. The broad gravel track takes you straight back to the car park.